AnimeEffects is a 2D keyframe animation tool based on deformation of polygon meshes. You can easily operate, quickly shape your idea, and remake at any time if you have changed your mind. AnimeEffects provides various animation keys such as Moving, Rotating, Scaling, Bone Deformation, Free-Form Deformation, Opacity, and Image Changing. You can import image files such as JPEG, PNG, GIF, and PSD for animation resources. AnimeEffects supports graphics tablet operation and canvas rotation it’s well-known functions of a paint tool, and it enables intuitive deformation. 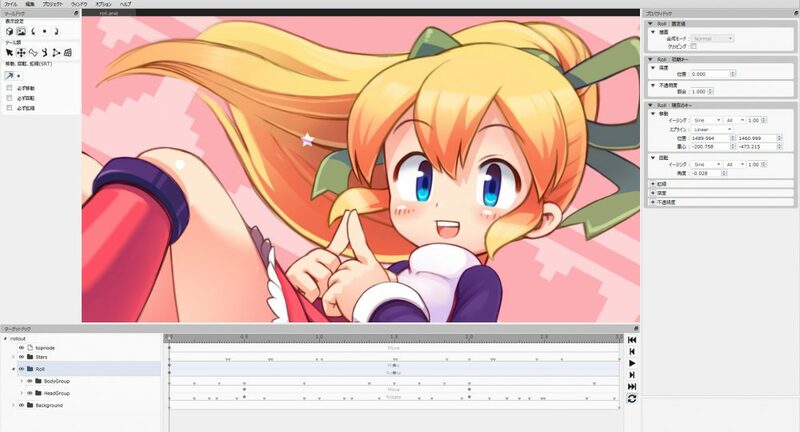 AnimeEffects is developed on http://github.com/hidefuku/AnimeEffects and distributed as a free software under the GPLv3 license. Of course, we do not impose any restrictions on a animation work using AnimeEffects. I hope that AnimeEffects helps your work even a little.